With The Avengers coming in 2012, the idea of a team-up movie featuring big-name superheroes will finally take root. But there's still never been a superhero buddy movie. Here are 10 pairings we'd love to see on the big screen. A superhero buddy movie might be the greatest thing ever. For one thing, it would provide a cool central relationship for the film to revolve around. For another, Hollywood knows how to do buddy movies, and some of the best action-comedies have featured an odd couple who have to work together to survive. And let's face it, beyond the ubiquitous origin story, Hollywood hasn't ever really known what to do with superheroes. There's a reason why non-origin-focused superhero movies are so uneven — the other thing that Hollywood seems to be able to pull off is the "superhero almost quits but then doesn't" story, like Spider-Man 2, Superman II and so on. Marrying the superhero genre with the buddy-movie genre would give Hollywood screenwriters a ready-made template for a new kind of superhero film. This is really the classic superhero buddy series. Both Power Man and Iron Fist were starring in their own comics, and doing perfectly well on their own. But together? They just kind of sparked something. And with Power Man, aka Luke Cage, taking a central place in the Marvel Universe lately (including a starring role in the New Avengers), lots of people are already talking about his movie potential. Put these two rough-and-tumble characters together, though, and you've got a killer movie. Power Man is an ex-con (he was innocent) who got himself some steel-hard skin in a prison experiment. Iron First is a rich guy who studied martial arts in the mystic land of K'un Lun and gained the ability to channel his Qi into his fist until it's (say it with me) "like unto... a thing of iron!" Anyone can hire them to go bust some heads, because they're the Heroes For Hire. Plus their love interests, Misty Knight and Colleen Wing, are also totally cool. It's probably a good thing that the Superman Vs. Batman movie that was being floated a decade ago never happened — it sounded like the reasons for the two to fight were kind of contrived. And we'd much, much rather see the two of them team up than fight — except for the epic showdown in The Dark Knight Returns, it's hard to think of a cool storyline in which it would actually make sense for Clark and Bruce to come to blows. But a Superman/Batman team-up movie could be all kinds of awesome — as you can see by reading some of the old World's Finest issues. Or, for that matter, Joe Kelly's Superman/Batman annuals. The occasionally tense friendship between these two has always been close to the heart of the DC Universe, and a Justice League movie will never work unless you get the Superman/Batman relationship right first. So maybe a Superman/Batman team-up movie could be the intermediate step before a JLA film? Just a thought. So we already have a Green Lantern film, coming next year, and it looks like it's going to be pretty awesome. Ryan Reynolds looks like he's going to be the perfect Hal Jordan — kind of cocky, a little bit immature, but a really solid guy who comes through in a tough spot. But assuming that the Green Lantern film is a hit, how do you follow that up? How about giving Hal a thorn in his side, in the form of the Emerald Archer? 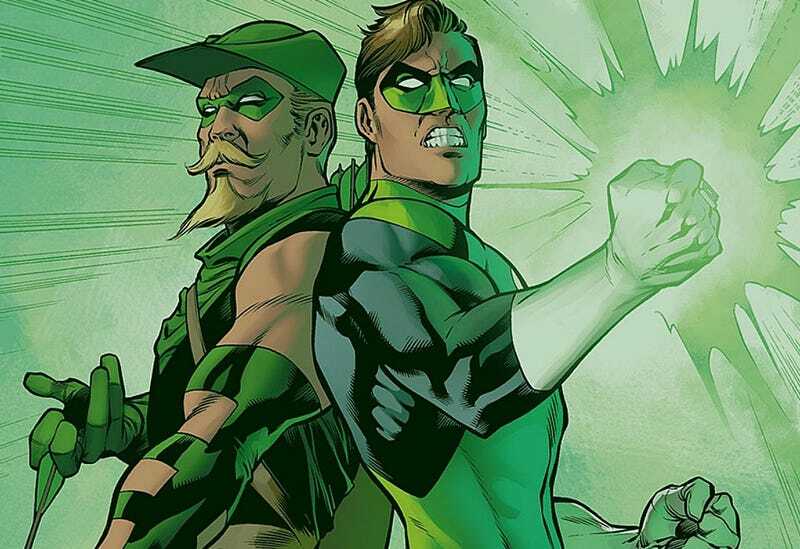 While I don't think it would necessarily be a good idea to redo the "two guys take off in a van to Find America" storyline, the dynamic between the straight-arrow Hal and the angry hippie Ollie would be a total thrill to see on the big screen. Plus now that Ollie's one of the main supporting characters in Smallville, he needs his movie debut. But skip the O'Neil/Adams "traveling across America" issues, as lovely as their art is, and go straight to the O'Neil/Grell issues, where Green Lantern and Green Arrow go into space and fight monsters! If you missed the recent run on The Incredible Hercules, which started up after World War Hulk, then you missed out on the most awesome pairing of two oddball heroes we've seen in forever. I admit we're unlikely ever to see a big-screen Hercules and Amadeus Cho feature, but that just proves the universe is insufficiently awesome. Amadeus Cho is the seventh smartest person in the world, and he's also a total smartass. Who has a coyote pup tucked into his jacket, and can use the power of Math to make any situation go his way. Hercules is, well, Hercules. A mythological demi-god who stumbles through life getting drunk and brawling, and uses his fists to handle any situation that may arise. Except for his daddy issues, which are immune to fisticuffs. Together, they're... totally dysfunctional and awesome. It would be an all-time epic. Seriously, if the movie version of the Marvel Universe ever really becomes one unified entity, then this is a movie that deserves to happen. The comics rivalry between the Friendly Neighborhood Spider-Man and the Fantastic Four's most hot-headed member is legendary, and whenever they meet up, it always gets totally insane. Their team-up miniseries, written by Dan Slott, was one of the funniest superhero runs we've read in forever. And they've got so many fascinating contrasts — the Human Torch is rich and successful, part of a superhero team that everybody loves, while Spider-Man is an outcast who can barely afford to pay his rent. Johnny Storm is a rockstar who has women all over him, while Spider-Man is stuck being married to a supermodel, until the Devil retcons his marriage. (Okay, maybe that last contrast doesn't quite work.) Still, if a film featured Spidey and the Human Torch as young heroes, trying to prank each other but eventually teaming up, it would rule. Mostly, we're just hoping a Deadpool movie actually gets made, with Ryan Reynolds' busy schedule and all. But if Deadpool does become the big-screen sensation he deserves to be, a good followup would be this recent series where he becomes pals with Nathan Summers, the son of Scott Summers who's traveled back in time to save the world from itself. The totally amoral, bugshit Deadpool winds up becoming part of Cable's plans to redeem the world, including weird storylines where they get infected with a virus that turns everyone blue, and then their DNA gets mixed together. The ways in which writer Fabian Nicieza keeps bringing Cable and Deadpool together, even though their outlooks on the world are so completely different, get cleverer and weirder as the series goes along. And really, the totally immoral Deadpool needs a super-idealist foil to bounce off of, at least sometimes. This comic was the greatest superhero send-up of all time, for my money. But it was also the greatest story of an unlikely friendship between two guys who get superpowers and don't know what to do with them. I've re-read my copies of the trade paperbacks so many time, they're practically just tatters. Basically, Eric and Woody are childhood friends, until Woody disappears one day, leaving Eric feeling betrayed. Years later, they meet up again, and get caught in a weird experiment that their fathers set up. The experiment leaves them with quantum-based superpowers — but it also means they have to be physically together at least once a day, or they'll both dissipate into nothingness. So they have no choice but to team up and become the world's worst superhero team. (Eventually they actually do become pretty effective, taking down the supervillain Magnum.) The publisher went under before we got to see how this series was going to turn out, but the existing issues would make for a fantastic movie about repairing a damaged childhood friendship. Make it happen, Hollywood! Thanks to Project Thanatos for suggesting this one! The pairing of Kitty Pryde and Wolverine, in the mid-1980s, was an important one for both characters. It helped to establish Wolverine as a mentor to younger mutant heroes, who could help them to discover their inner strength to go along with those mutant powers. And it helped develop Kitty Pryde from a cute "kid sister" to a more complex character. Without this team-up miniseries, Kitty Pryde probably wouldn't be the beloved character she was today, and maybe Joss Whedon wouldn't have felt the need to get rid of her. (Just kidding!) Seriously, though — Wolverine has starred in one solo movie and three X-Men movies already, and he's still kind of a one-dimensional character. What would really give Hugh Jackman a chance to stretch out would be to give him a younger hero to mentor and grow. Plus since this miniseries ties in with Wolverine's Japanese soujourn and his whole "Bushido" phase, it could be a follow-up to Wolverine's upcoming Japanese adventure movie. From 1971 to 1978, the de facto name of Captain America's comic book was Captain America and the Falcon, and it featured the World War II hero teaming up with the inner-city savior. (There was an attempt to relaunch this concept in the mis-2000s, from the writer of Quantum and Woody, but it failed hideously and is best forgotten.) The friendship between Steve Rogers and Sam Wilson is one of the coolest partnerships in mainstream comics — Cap inspires the Falcon to become a better hero and rise above, but they're also true equals who depend on each other. Okay, so this is more than two characters, but in its classic version it's still less than the usual superhero team. A Birds of Prey movie that featured just Black Canary and the Huntress going on missions while Oracle outsmarts their opponents and hacks into every computer on the planet would be pretty nifty. It would have to be based on the early issues of Gail Simone's run, featuring Black Canary getting captured by a psychopath and having to bust out despite being horribly injured. Bonus: The Ambiguously Gay Duo. It's Steven Colbert and Steve Carrell, and we just saw the other night how great those two are together. Yes, SNL sketches that turn into big-screen movies are usually disastrous and unbearably unwatchable. But this would be different!